CarsDirect was founded in 1998 as a research service for American car shoppers. The website provides information about vehicles, vehicle insurance, and local dealerships. CarsDirect was the first website to ever sell vehicles directly through the Internet, and has been voted a top website in its industry by Auto Dealer Monthly, Time Magazine, and many others. Like many other car shopping websites, CarsDirect provides a way for users to compare listings from local dealerships. This website only shows dealership listings, not private listings, but has quite a few features that can help shoppers compare prices and offerings in their area. 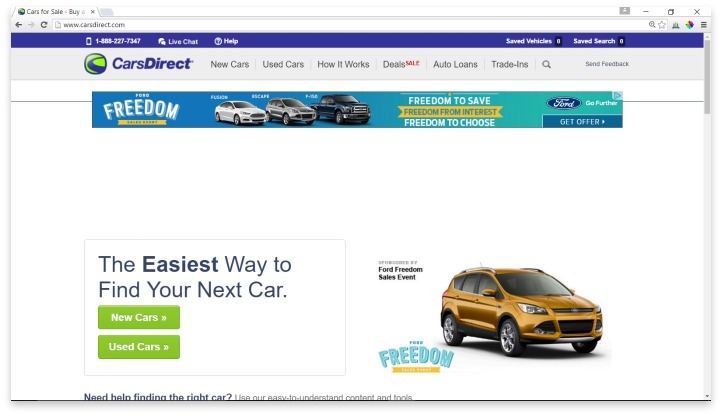 Where CarsDirect stands out is its focus on connecting car shoppers to funding options, especially for those with bad or no credit history. CarsDirect isn’t a lender itself, but rather acts as a broker, finding dealers and lenders in your area that are willing to work with you. While users can see offers online, and even connect with dealers through the website, they no longer offer the ability to buy a car outright on their site. This means that users still have to go into the dealership to sign paperwork, and there is nothing stopping dealers from raising the price from what was listed on CarsDirect. CarsDirect has a pretty simple search feature, with an easy-to-navigate website that is clean and uncluttered. They also offer articles that can help shoppers learn how to choose the right car for their life, how to negotiate better prices, and how to understand many other aspects of car shopping. Like the popular Edmunds.com, they also offer a comparison feature, which allows users to see how their choices may differ. This is great if you are on the fence about several options. CarsDirect has both a phone number to call and a live chat option for customer service, as well as a detailed FAQ and Help section on the website. They allow users to request a CARFAX report be emailed to them directly from any listing, and they also offer information on special deals that are taking place in your area at the moment. But these features are all that CarsDirect has to offer. There is no way to list your own car for sale, see user or expert reviews, or guarantee that the price you see online is what you’ll get when you go into the dealership. Overall, CarsDirect is a very solid, if rather basic, listing service. If you want to find cars for sale in your area, but want to avoid less trustworthy places like Craigslist, then this is a great place to look. And if you’re looking for special low-pricing events at local dealerships, you’ll also find that CarsDirect is a great resource. But unless you are specifically ready to begin your local shopping, you are probably better served by a website like AutoTrader or Edmunds, where you’ll find more features and more knowledge to help you narrow down options better. Everything that CarsDirect does, they do as well. It all boils down to which website you like the look of better, but from our experience: you’ll probably find more information, better deals, and more listings, on a different website. Have you had an experience with this company? Please share your CarsDirect Reviews below.